The mold presence requires sufficient humidity and the presence of nutrients. Practically, whenever these conditions are met, we also see their development. For example, the Aspergillus restrictus mold at 20 ° C and 75% humidity needs two months to germinate. If there is 80% humidity – it needs only a week, and at 85% - it needs four days. The first symptom of this, even when there are no visible traces, is the smell of spores. Appropriate organic substances are found throughout the home - wood, textiles, carpets, leather, wallpaper, dust. Therefore the nutrient environment factor can not be counteracted. If we want to prevent our home from the appearance of mold, we have to concentrate on the humidity in each room. It is necessary not to allow relative air humidity to exceed 75%, and most preferably – it must stay below 65%. High humidity can be formed by placing furniture tightly to outside walls, shutting down overnight heating, insufficient heating and ventilation, thermal bridges, building defects, etc. What preparation to use for mold removal? There is a wide variety of mold cleanup chemicals available on the market. The ordinary bleach is in fact just as effective as professional mold removal preparations. For particularly severe cases, if the contaminated surface allows it, oxygen water is used. Many people believe that if mold has appeared at particular room, the place is already "infected" and there will always be recurrences. For this reason, many people are looking for salvation in "disinfection". This is a misconception. Spores of molds are everywhere around us, and there is no real opportunity to get rid of them. Whenever we create the right conditions, we will also observe their stormy development. For this reason, the unifying quality of chemicals is the perishable effect. The right approach to the mold removal problem is to remove the cause of molds. At normal air humidity molds can not grow, so it is especially important to properly ventilate and heat them. What is the principle of action of paint against mold? There are three varieties of paints on the market that act against molds. Unfortunately, none of these funds is devoid of serious deficiencies. Fungicide paints have added substances that are toxic to molds and are extremely effective for mold cleaning. There are a number of effective biocide preparations, but unfortunately their use is not safe for humans and domestic animals and is therefore highly unsuitable for use in homes. Thermo-insulating paints contain micro-granulated heat-insulating materials. Also popular are products containing vacuum ceramic spheres. Their action against molds is based on the isolation of the thermostats and the elimination of condensation conditions. Due to the small thickness of the coating obtained, its heat-insulating properties are not good and the beneficial effect is relatively weak. Non-chemical anti-fouling paints contain saturated solutions of innocuous salts which crystallize on the surface of the coating to create a mechanical barrier to mold development as well as salting condensate to the extent that it is an inappropriate development environment. Depending on the specific conditions, the effect of their application ranges from very good to bad. In places with frequent condensation, their application is pointless. 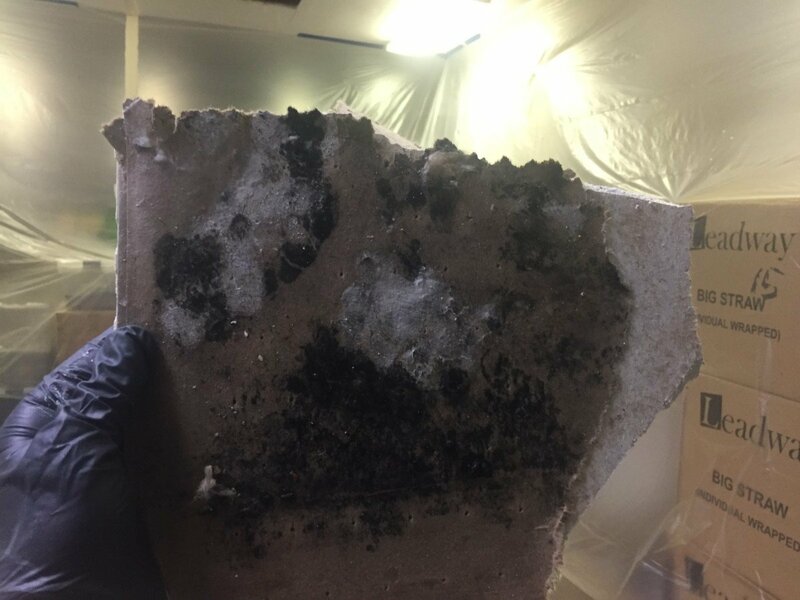 If you find tempting the idea of purchasing cheap one-time chemical moisture absorbers as a mold removal tool, think twice! If we consider the cost of a consumable per liter of extracted water, we will see that the cheap is actually quite expensive. Chemical absorbers represent a vessel over which a highly hygroscopic substance (calcium or lithium chlorides or bromides) is placed. The aim is to allow the moisture of the air passing through the substance to be removed and the resulting aqueous solution to be discharged into the vessel. Insufficient desiccation capacity: Depending on the amount of hygroscopic salt in the chemical hoods, the maximum amount of water they can draw within two months is from half to three liters, and within a day, they can usually achieve only a small percentage of these values. This is extremely inadequate even for the smallest rooms. By comparison, domestic condensation dryers have a nominal capacity of 10 to 45 liters per day. Lack of intense air circulation: To achieve a significant effect in mold removal and mold prevention, the entire air in the room must at least once per hour pass through the irrigation device. For this purpose, the discharge units have a fan with a flow rate of more than 100 m3 / h. The sold chemical hoods do not have forced air circulation and their flow is symbolic. Many people are interested in the topic mold cleanup. Sometimes they even wonder do they need to break the plaster to cope with the problem. In a new construction this is not necessary. It is possible that the reason for mold appearance is in incorrect ventilation and heating. If you have removed the conditions for development, mold will no longer appear. Instead of breaking the plaster, the site can be treated with a suitable detergent and sealed to prevent the particles that are harmful to health from getting into the air. In old buildings mold removal is difficult, time consuming and expensive. In view of the significant health risks, it is advisable to leave mold cleaning process in the hands of specialists. What you can do to prevent mold appearance is to open the windows every day to ventilate the room. Moreover, don’t leave cups of water in the room where you sleep.